Treatment of cryptococcal meningitis in patients who are unable to tolerate amphotericin B. Note: Data suggests that the clinical efficacy of fluconazole is lower than that of amphotericin B in the treatment of acute phase cryptococcal meningitis. Maintenance therapy to prevent relapse of cryptococcal meningitis in patients with acquired immune deficiency syndrome (AIDS). Treatment of oropharyngeal and oesophageal canidiasis in AIDS and other immunosuppressed patients. Secondary prophylaxis of oesophageal canidiasis in patients with human immunodeficiency virus (HIV) infection. Serious and life-threatening Candida infections in patients who are unable to tolerate amphotericin B. Note: It remains to be shown that fluconazole is as effective as amphotericin B in the treatment of serious and life-threatening Candida infections. Until such data are available, amphotericin B remains the drug of choice. Vaginal candidiasis, when topical therapy has failed. Treatment of extensive tinea corporis, extensive tinea cruris and extensive tinea pedis infections in immunocompetent patients in whom topical therapy is not a practical treatment option. Usually, topical therapy should be attempted first because oral therapy has a less favourable ratio of benefits to risks. (See Adverse Reactions). 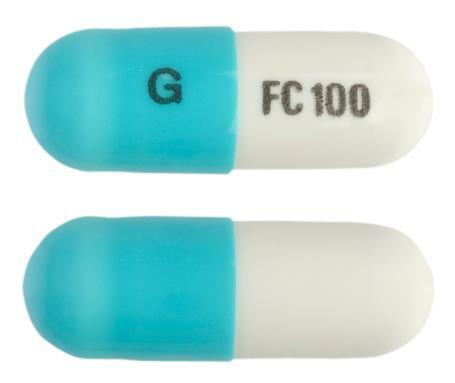 Size 2, hard gelatin capsule with white opaque body and blue opaque cap; the body has 'FC 100' and the cap has 'G' printed in black. 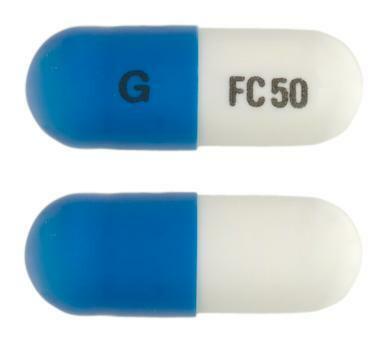 Size 4, hard gelatin capsule with white opaque body and dark blue opaque cap; the body has 'FC 50' and the cap has 'G' printed in black. Size 1, hard gelatin capsule with white opaque body and white opaque cap; the body has 'FC 150' and the cap has 'G' printed in black. Treatment of cryptococcal meningitis in patients who are unable to tolerate amphotericin B. Note: Data suggests that the clinical efficacy of fluconazole is lower than that of amphotericin B in the treatment of acute phase cryptococcal meningitis. Maintenance therapy to prevent relapse of cryptococcal meningitis in patients with acquired immune deficiency syndrome (AIDS). Treatment of oropharyngeal and oesophageal canidiasis in AIDS and other immunosuppressed patients. Secondary prophylaxis of oesophageal canidiasis in patients with human immunodeficiency virus (HIV) infection. Serious and life-threatening Candida infections in patients who are unable to tolerate amphotericin B. Note: It remains to be shown that fluconazole is as effective as amphotericin B in the treatment of serious and life-threatening Candida infections. Until such data are available, amphotericin B remains the drug of choice. Vaginal candidiasis, when topical therapy has failed. Treatment of extensive tinea corporis, extensive tinea cruris and extensive pedis infections in immunocompetent patients in whom topical therapy is not practical treatment option. Usually, topical therapy should be attempted first because oral therapy has less favourable ratio of benefits to risks. (See Adverse Reactions). 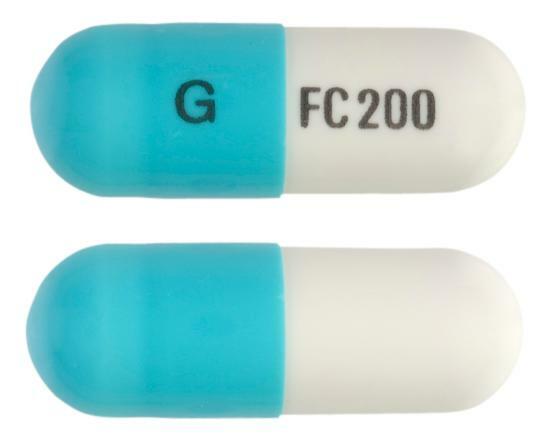 Size 0, hard gelatin capsule with white opaque body and blue cap; the body has 'FC 200' and the cap has 'G' printed in black.